1. Wash the chana dal and soak it so that it is fully submerged for 2 hours. 2. Grind the chana dal together with all the other ingredients until the mixture forms a coarse paste. Add water if needed, but be careful as too much water can make it harder to form patties. This happened sooner than I expected and I ended up with a paste finer than I would have liked. The bite from dal gives great texture. 1. Make flat-ish patties out of the ground mixture. 2. Heat oil in a shallow pan and place 4-5 patties in the hot oil. Cover the pan and let it cook for about 3 mins. 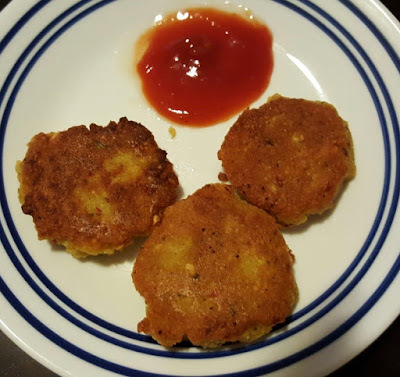 Then turn the patties over and fry them on the other side for 2-3 mins or until browned. Serve with ketchup or other dip of your choice. Hummus is a wonderful thing. I had never had hummus until I came to the US. It soon became one of my favorite things to order in a middle-eastern restaurant. 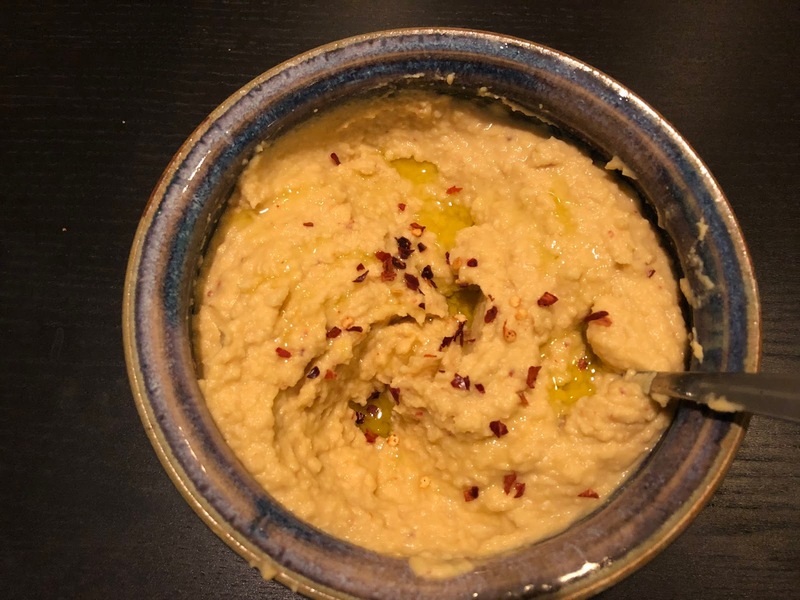 My relationship with hummus grew stronger and a few years back I started making it at home. 1. Dry-roast the sesame seeds until light brown. Put aside. 2. Chop the garlic and fry it for a couple of minutes. This is to avoid the taste of raw garlic, especially if you plan to store the hummus for a few days. 3. Blend the sesame seeds and the olive oil until the seeds are crushed and blended with the oil. 4. Blend the chickpeas, garlic, lemon juice, salt, pepper and red pepper flakes with the above sesame paste. I had made this recipe for the Thanksgiving of 2012 and had put some notes on my blog post about how I would tweak it next time. And that is exactly what I did this Thanksgiving and it came out better :). What a nice feeling. This is exactly what I started this blog for. To keep track of what I make and to keep notes on the recipes. This Thanksgiving was perfect. My cousin and her family came over and we watched football and had a lazy lunch for which I made butter chicken followed by coffee and dessert (recipe below) and a late chai. That's the kind of Thanksgiving meal I like. Here is the recipe for pumpkin pecan crunch with my tweaks. Recipe based on Pumpkin Pecan Crunch. Yellow cake mix recipe based on this one. Spray a 13×9 baking dish with non-stick spray; set aside. Beat the eggs in a large bowl. Add to it the pumpkin, evaporated milk, brown sugar, 1 cup of the white sugar, 5 teaspoons of the pumpkin pie spice, vanilla and salt until well-blended. Pour into prepared baking dish. Mix the remaining 1 cup white sugar and 1 teaspoon pumpkin pie spice with the all-purpose flour and the baking powder. Blend with wire whisk. Sprinkle this dry mix evenly over pumpkin mixture. I'm trying out a new way of eating healthy. Instead of focussing on what not to eat I'm trying to focus on what I should be eating everyday. 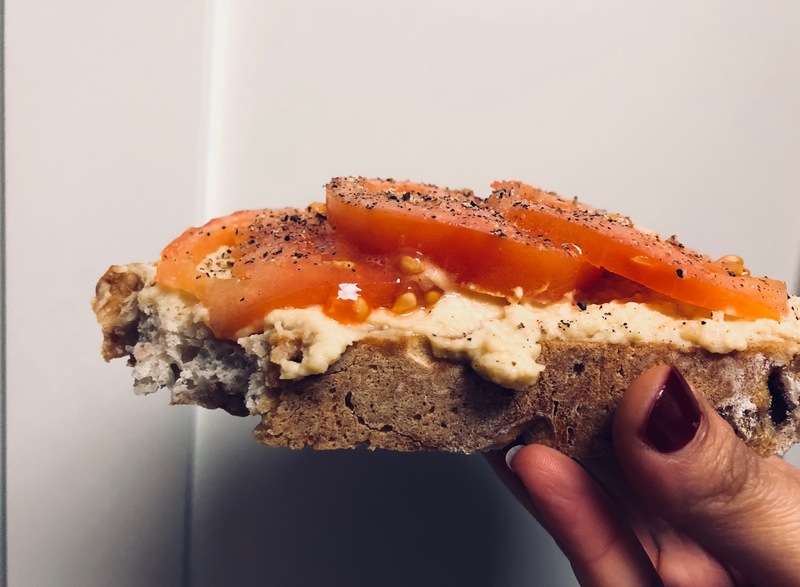 Here are some snacking options that you can go to whenever you are thinking of reaching out for that cookie or ice cream, and instead pick something from the list that you have not eaten all day. The whole fruit, not fruit juice. Fruit juice contains too much sugar while fruit skin contains valuable nutrients and insoluble fibre. Make sure to steer clear of sugary flavored yogurt. My favorite is plain non-fat greek yogurt with a dash of honey and sliced almonds. More of peanuts and almonds. Some cashews, pistachios, hazelnuts, walnuts. I combine this with a little bit of cheese to make a filling snack. Chickpeas, black beans, kidney beans and many others. This works as a snack only if you have canned or cooked beans handy. Some of my favorites are Black Bean Salad and Chickpea Salad. Hummus is a great thing to have in the fridge and makes for a great beany snack with crackers. With some planning, beans can be incorporated into meals easily. My favorite is boiled egg with salt and pepper. While putting this into practice, the challenge is that the cookie is readily available whereas beans or oatmeal or eggs are not. The way around that is to find simple and quick yet tasty ways of preparing them and eating them ceremoniously. This last bit is very important. If you are eating an apple, cut it and put it on a plate, add a dash of seasoning (yes I do that) and then eat it. If you are going for a boiled egg, cut it into cross-sectional pieces, sprinkle salt and pepper and eat it out of a plate with a fork. Eating even a simple thing ceremoniously satisfies our indulgent side. I'm posting something after a really long time - blame it on two big events - new job and new house. My new job is located in a very exciting area of SF, especially from a foodie's point of view. I can eat lunch and buy produce at the Ferry Building everyday if I wanted to. What more can a food-lover ask for? Friends and family have been visiting to see the new house. Recently at one of the parties I baked a cake that is so perfect for fall. Mix the dry ingredients: flour, baking soda, pumpkin pie spice mix and salt. Add these dry ingredients to the pumpkin mixture, and beat until well blended. Pour batter into a greased 15 x 10 inch baking pan. Bake at 350 degrees F for 25 to 30 minutes, or until done. Let cool. Beat the cream cheese, butter and vanilla until smooth. Gradually add 1 & 1/2 cups confectioners' sugar, and mix well. Add milk until frosting reaches desired spreading consistency. Frost cake, and sprinkle with pecans. 1. Cut eggplant into very thin round slices of roughly 3mm width. A mandoline slicer comes in handy for this. For slices that are too big, cut in half. 2. Put all the spices and the salt in a bowl and mix well. 3. Take a large baking tray, cover it with aluminium foil and grease it with oil or spray generously with oil spray. 4. Take half of the eggplant slices on the baking tray. Drizzle oil or oil spray over them. Toss them well with half of the spice mix, making sure you rub both sides of every slice with the spice mix. 5. Then arrange them in a single layer on the tray and once again drizzle with oil or oil spray. 6. Repeat steps 3, 4, 5 for the rest of the eggplant slices. 7. Bake at 350 deg for 15 mins and then broil at 350 deg for 5 mins. Watch them frequently as they can get burnt easily. You may have to adjust the oven times according to the thickness of the slices. The slices may look burnt when done but taste great and crispy! The thicker slices will most probably remain soft. I combined them with some crispy slices and put them in a sandwich - tasted pretty good. 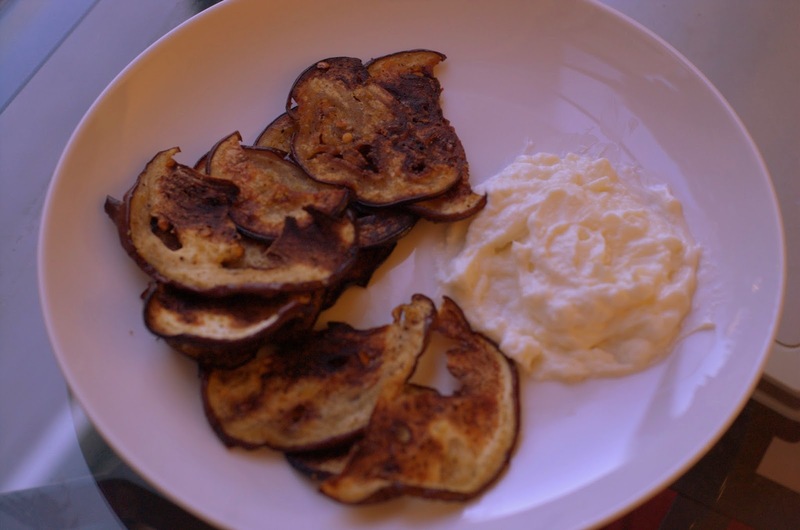 We had the eggplant chips with a very simple and quick dip. For the dip, take a half cup of low fat ricotta cheese and add 2 tbsp of mayonnaise to it. Mix well to make the ricotta a bit more creamy and less grainy. Other creamy dips would also go very well with the chips, such as a greek yogurt-garlic dip. Last year I had the opportunity to meet Nigella Lawson at a book signing for her book 'Nigellissima'. In an interview before the signing she mentioned that her coffee ice cream recipe from the book is one of her favorite recipes. What's good enough for Nigella is good enough for me, so I tried it and it turned out to be fabulous! It was hard to believe it was made without an ice cream maker and yet tasted exactly like great ice cream. Apparently it is the alcohol that keeps the ice cream from become icy. I followed the recipe from the book, which is slightly different from the recipe from her blog, though I don't know if that matters. For the instant espresso powder I used Medaglia D'oro brand. Next time I would reduce its amount from 2 tbsp to 1.5 tbsp as I thought the ice cream was a tad stronger than I'd like. I think it would be ok to use instant coffee too, though in that case you might need more of it. For the coffee liqueur I used Kahlua and it seemed to have worked well. I also thought the ice cream was a bit too creamy. I don't know if half-n-half can do the job of heavy cream in the recipe. I might try out a 60-40 mix of heavy cream and half-n-half next time. I served the ice cream with a stick of chocolate wafer. Next time I'm planning to add some kind of nuts such as walnuts or chocolate-covered almonds to the ice cream before freezing it. Or even choc brownie pieces. The possibilities are endless! One thing to note: The ice cream took an awfully long time to freeze. I made it in the morning and served it at night, but it was far from set. But after a couple of days it set beautifully and the picture above was taken at that time.